The Galleries’ first-ever solo exhibition, which features photographs by Sonia Handelman Meyer, will be on display until Oct. 10 at the Galleries at the Cabarrus Arts Council, 65 Union St. S., Concord. Meyer captured images at a crucial time in American history. The Great Depression was over and soldiers were returning from victories in World War II, but many people were still hungry, jobless and homeless. As a member of the New York Photo League, Meyer brought awareness to the plight of immigrants, minorities and the poor as the she photographed the city in the 1940s. Her amazing eye and unimposing persona allowed her to take pictures that pull the viewer in and give us a better understanding of the social, political, and personal struggles of the period. The famed New York Photo League was instrumental in bringing fine art photography to the United States, according to Collins. The league offered its members a forum for serious photography, including classes, workshops, a darkroom and exhibitions. Meyer’s connection with the cooperative of photographers began with a beginner’s class in 1942 and included what she called “eye-heart-soul opening” workshops. Meyer and fellow league photographer Morris Huberland took still photographs at the nation’s first integrated hospital, Sydenham Hospital in Harlem for a fund raising film. She photographed an anti-lynching rally in Madison Square Park, a Jehovah’s Witness convention at Yankees Stadium, the first publicity photos for The Weavers folk group, on Coney Island and at the Hebrew Immigration Aid Society. 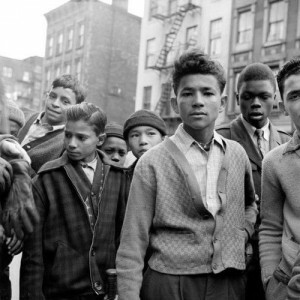 Mostly, she photographed people going about living their lives in Spanish Harlem, Greenwich Village and Midtown Manhattan, especially children. Meyer said that she often snapped one, maybe two, photos and moved on without the subject ever realizing his image had been captured. She used photography as a way to overcome her fear of walking the city streets as a young woman, and she saw things that she might have overlooked had she not held a camera. After the photo league closed in the early 1950s, Meyer turned her attention to marriage and then a family. Her prints and negatives were packed away in boxes, and her work was not shown again until 1978, when three images were included in the International Center of Photography’s exhibition, This Was the Photo League. In 2002 she moved to Charlotte to be near her son, Joe, and his family. A few years earlier, Joe had showed some of his mother’s work to Lili Geer, who was at that time an art history professor at the University of North Carolina at Charlotte. Geer assigned a student to work with Meyer on cataloging her work. In 2007 Carolyn DeMerritt, a photographer whose work has also been shown at The Galleries, organized an exhibition, appropriately called Into the Light, for Hodges Taylor Gallery in Charlotte. Many more exhibitions have followed at the Mint Museum, Wachovia Center and Hodges Taylor Gallery, Charlotte; Taylor Bercier Fine Art, New Orleans; Montgomery Museum of Fine Arts, Montgomery, AL; Higher Pictures Gallery and The Jewish Museum, New York City; Fairhope Unitarian Fellowship, Fair Hope, AL; National Museum of Women in the Arts, Washington, DC; Columbus Museum of Art, Columbus, OH; Contemporary Jewish Museum, San Francisco; and Norton Museum of Art, West Palm Beach, FL. The Galleries’ exhibition, titled simply Sonia Handelman Meyer, includes more than 40 photographs which will be spread among the four galleries. Meyer plans to attend Collectors Circle on Wednesday, Aug. 19, 5:30-7 p.m., and Art Walk on Friday, Aug. 28, 6-9 p.m. Collectors Circle will provide the opportunity to further explore Meyer’s work and the New York Photo League. Art will feature the opening reception for the exhibition as well as visual art displays and entertainment all over downtown Concord. The Galleries are located in the Historic Cabarrus County Courthouse at 65 Union St. S, Concord. They are open Monday-Friday, 10 a.m.-4 p.m. Tours and exhibition-related activities for children are available. Admission and activities are free. For more information or to schedule a tour, call 704-920-2787.